This is not your grandmother’s jam. Unless, that is, your grandmother is from Thailand. I learned the recipe from Bangkok-born food-blogger/jam-maker/restaurateur Pim Techamuanvivit, and have been making it at home ever since. I’m not kidding when I say this is unlike any other jam you’ve ever had (even other chile versions that tend to use fresh peppers and too much sugar). This one hits on all cylinders: it’s spicy (dried chiles), salty (fish sauce), sour (tamarind paste), and sweet (palm sugar), and deep with the flavor of golden-fried garlic and shallots. 1. Combine the tamarind paste with 1 ⁄ 2 cup very hot water, and break up the paste with a spoon or your fingers; soak for a few minutes, breaking up the paste a few more times if needed. Push the mixture through a mesh strainer with the back of a spoon; set aside the pulp that passes through the strainer, and discard what remains inside the strainer. Stem and seed the chiles. 2. Heat the oil in a wok or large skillet over medium-high heat until hot but not quite smoking. Add the chiles, and cook, stirring, for 15 to 20 seconds, making sure they don’t burn. Remove with a slotted spoon, and transfer to a plate. 3. Add the garlic to the oil, and fry, stirring frequently, until just golden brown. (It will continue to brown after it’s out of the oil, so don’t go too dark now.) Transfer to the plate with the chiles. Fry the shallots until golden brown, and transfer to the plate. Turn off the heat, leaving the oil in the pan. Transfer the chiles, garlic, and shallots to a food processor; pulse, scraping down the sides as necessary, until the mixture turns into a paste (no need to make it totally smooth). 4. Turn the heat under the pan to medium. Add the shrimp paste, and cook, stirring and breaking it up, for about a minute or two. Add the palm sugar, and cook, stirring, until it dissolves. Add the chile, garlic, and shallot mixture, the tamarind pulp, and 2 tablespoons of the fish sauce. Stir to combine, turn the heat to low and cook, stirring occasion- ally so the bottom of the pan doesn’t burn, until it thickens slightly, 2 or 3 minutes. Taste the mixture; if it still needs salt, add more fish sauce, a little at a time. 5. 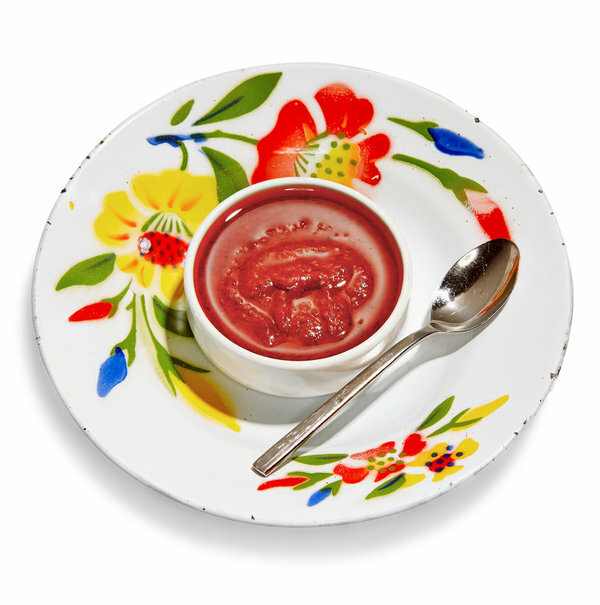 You can store the jam (and the oil) in a jar in the fridge or freezer; use it in stir-fries or soups, spoon it on top of rice, noodles, cooked seafood, tofu, meat, poultry, or vegetables, spread it on toast, or use it in salad dressings.